Burning Bridges is a beautifully sad, yet satisfying, dystopian love story. On one side of the border you have New Haven. Here you meet beautiful Echo, Princess of Thediby. She is 17 years old, next in line for the throne, and betrothed to a prince. She has a house full of servants and her every need and want is tended to. What more could a princess ask for? Freedom, of course. Instead of enjoying her life of luxury, Echo feels weighed down by a world she doesn't quite fit in to, a marriage she doesn't really want, and a family who either doesn't understand her or just doesn't care. On the other side of the border you have Old Haven. This the Haven where Ayden grew up. Ayden is the oldest son of an ill mother and an alcoholic father. He spends his days working at any job he can get to pay off his father's debts to the king. He dreams of a better life for him and his family. A life where he isn't constantly working, where they have enough food to eat, and one where he can pay for his mother's medicine. He dreams of a life where he can afford to send his brother and sister to school and a life where his father takes responsibility for his family. "Two Havens, Two People! Two Worlds, Two Wars! Difference is Essential." In the first chapter of this book you find Echo and Ayden chained to the wall in her father's dungeon. Their crime? Loving each other. Their sentence? A fight to the death! How could you not get swept up in this story? 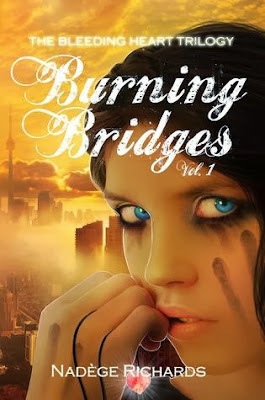 Nadege Richards keeps you on the edge of your seat the entire time with this action packed love story with a very imaginative plot and some very realistic well written characters. I really liked the alternating POVs. It was refreshing to know what each character was thinking and feeling throughout the book. Ayden and Echo's love is a forbidden love. They break more than one of the king's laws in their efforts to be together but they don't let that stop them. I loved the way they grew together. They started out as two young people who barely liked each other and blossomed into two people who loved and trusted each other enough to put their life in the other's hands. Burning Bridges was a great read that kept me up well past my bedtime. 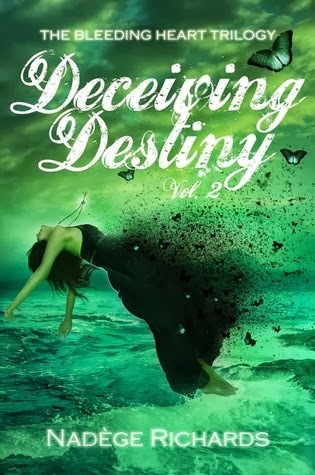 I very much look forward to reading the next book in the series, Deceiving Destiny, and finding out where Echo and Ayden's journey takes them next. ALSO AVAILABLE AT AMAZON AND B&N!